/ The 67 Steps by Tai Lopez Review – Is It a Great Product? The 67 Steps by Tai Lopez Review – Is It a Great Product? What is Tai Lopez’s 67 Steps About? Tai Lopez is an entrepreneur who exemplifies a rag to riches story. Through years of trial and error, and under the assistance of mentors, Tai Lopez worked to achieve financial independence. With three key things to keep in mind, Tai Lopez created the 67 Steps. Throughout the 67 individual videos, Tai Lopez and the 67 Steps will teach you how to improve your financial situation and start living the good life. The 67 life lessons that Tai Lopez divulges are aimed at helping you achieve better health, more wealth, improved relationships and increased happiness. Who doesn’t want that? Is Tai Lopez’s 67 Steps a Scam? No, Tai Lopez’s 67 Steps is not a scam. You get exactly what you pay for, which is 67 videos detailing life lessons and tips to improve your wealth, health, relationships and happiness. The videos aren’t too costly either, and you get lifetime access to them. That means if you want a refresher in a few months or years, you can just revert back to the videos that you’ve downloaded. The one issue with Tai Lopez’s 67 Steps program is that the videos can be a bit generalized. They don’t necessarily lay out a clear path or system to generate income like other training programs do. If you think this is a specific 67 step by step course that will tell you exactly how to generate income, you might feel slighted or scammed when you complete the 67 videos. 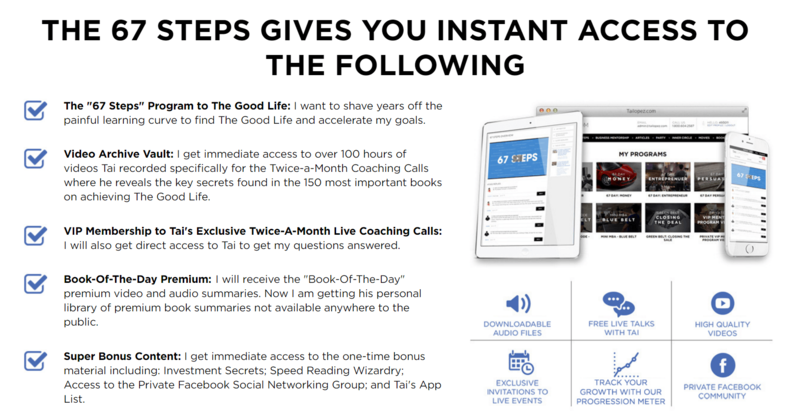 The cost to gain access to Tai Lopez’s 67 Steps is just $1 per video. That equates to a total cost of $67. This isn’t overly expensive like other programs and you get lifetime access to the videos without having to maintain a membership that comes with a monthly or annual renewal fee. However, once you make it through the steps you will be subjected to up-sells for Tai Lopez’s other products. For the one-time price of $67, the program offers a decent value. If you get sucked in and start signing up for all of the additional up-sells, that’s when the program can get very costly and out of control. So you can look at this product as a sales funnel for other more expensive products that Tai Lopez has. The 67 Steps by Tai Lopez is an interesting product to review because it is quite different than others. This isn’t a cut and dry business system that you follow step by step to start generating income. The information is more generalized and based off the life lessons of one man, a successful entrepreneur named Tai Lopez. Aside from slightly general information in some of the videos, and leaving viewers to deal with up-sells for other Tai Lopez products, the 67 Steps training course isn’t a bad deal. For just a one-time cost of $67, you will get lifetime access to all of the videos. That means if you would like to get access to the videos a few years after watching them the first time, you can do so at no extra cost. You also don’t need to worry about monthly or annual maintenance fees, because once you purchase the videos you won’t need to open your wallet again, unless of course you get roped in to one of Tai Lopez’s up-sells. Tai Lopez was involved in many different products. I have reviewed another product called: “OMG Machines” which has a ridiculous price tag of $8,000 and Tai Lopez does lots of videos where he is trying to pitch this program and explain why it has so much value and totally worth $8K. In general if you follow videos made by Tai Lopez he does lots of psychological training which in one way gives you really good information and lots of empowerment but on the other hand is used as a great marketing tool to promote his products. So you are the judge after all if you like Tai Lopez or not. The 67 Steps by Tai Lopez is for anyone that is interested in bettering themselves. His videos focus on improving your whole self, in relation to happiness, wealth, health and your relationships. Even those who are experienced entrepreneurs that are already generating income online can take advantage of the videos if they need to refocus on their goals and better the lives. All you need is $67 and access to the internet to download the files. If you are someone looking for a program that lays out a step by step training program to create an online business and start generating income, then this is not for you. This is where up-sells come through. The tools and support offered through the Tai Lopez 67 Steps program are a non-factor. After all, these are essentially lifestyle tips and not necessarily centered on developing an online business to make money. In terms of training, Tai Lopez delivers 67 videos that give insight on different life lessons, while offering tips to improving your life. These range from being adaptable and how to find a mentor, to building on your strengths and finding a job you like. These videos are informative and draw on real life people and examples to help you relate more. While you aren’t given training on how to specifically make money online, you are given tips on achieving the right mindset to become a successful entrepreneur. 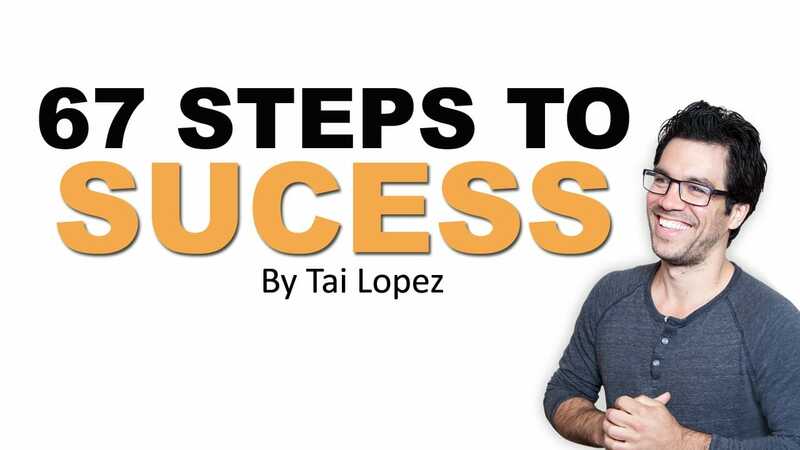 Tai Lopez’s 67 Steps is not a scam, but it also isn’t a clear cut path to success. Essentially what you are getting is 67 videos detailing one man’s life lessons and some tips for how you can improve your life in regards to health, wealth, relationships and your overall happiness. With videos on topics as vague as finding a mentor, escaping the salary mentality, and being tough, many people fail to even make it through all of the 67 steps. It is true that a good deal of the information Tai Lopez divulges is generalized and what some would call common sense, but there are some good gems of information hidden in the videos. If you’re looking for an attitude reboot, $67 isn’t an extraordinary cost to get focused and your goals on track. If you’re looking for a system or program that will help you establish an online business and start generating income, this certainly isn’t that and you should steer clear. In the end, it all depends on what you are looking for.